A pilot whale has died at SeaWorld in Orlando, Florida, the park has announced. 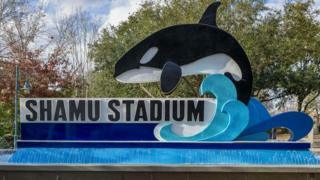 It comes after another whale, an orca, died at the same theme park in January. The pilot whale, Fredi, was rescued in 2011 after becoming stranded on a beach in Florida and had “persistent health concerns”, a statement from SeaWorld said. The park discovered that Fredi had an infection and her health continued to decline sharply, the statement said. The whale, also known as 301, was one of 23 short-finned pilot whales found stranded eight years ago. She was deemed non-releasable by the National Oceanic and Atmospheric Administration and was sent to reside at SeaWorld. A statement from SeaWorld said: “301 lived the past eight years at SeaWorld with a pod of rescued pilot whales and received world-class care and a second chance she would not have had otherwise and provided the rescue team with invaluable knowledge on how to respond to, and care for stranded animals. SeaWorld confirmed that the animal had been “undergoing an aggressive anti-microbial treatment to treat a persistent infection”. It said it would be monitoring other members of the pod for signs of infection. According to a US government estimate, short-finned pilot whales typically live around 35-60 years. Animal rights groups have argued that those in captivity have a shorter life expectancy. SeaWorld has faced backlash after its killer whale programme became the focus of 2013 documentary Blackfish. The film criticised the park’s captivity practices and use of whales in shows. Following the release of Blackfish, SeaWorld announced that it would be phasing out its shows and ending its breeding programme.